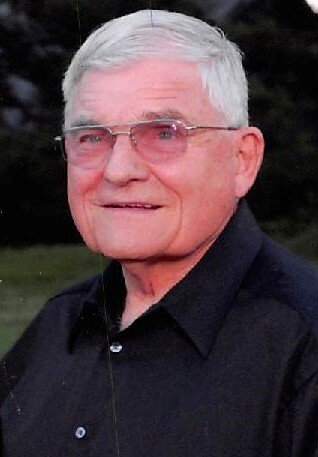 Dale Dean Forsstrom, age 86, of Ogallala, Nebraska, passed away on April 14th, 2019 in Ogallala. He was born May 8th, 1932 in Hemingford, NE to parents Carl and Edith (Bowser) Forsstrom. He developed a love of sports early on, which later grew to become one of his greatest passions. He graduated from Hemingford High School in 1950 and received a medal from the Omaha World Herald acknowledging his high school baseball accomplishments. He also briefly attended Chadron State College. Dale married his high school sweetheart, Betty Blackstone, on August 4, 1951. This was the beginning of a lifelong partnership which blessed them with 3 children Carla, Kathy and Doug. Dale was always working to improve his family’s lives, and with that goal at heart, he became a true entrepreneur. While working for Box Butte County, Dale had dairy cows that he milked and Betty worked delivering the milk around Hemingford. Dale went to barber school in Denver in 1959, then went back to open a barber shop in Hemingford. He also purchased the Dairy King that Betty operated during the day and Dale closed the business at nighttime. In 1964, Dale purchased a Culligan Soft Water business in Hastings, NE. After a few camping trips to beautiful Lake McConaughy, Dale and Betty set their sights on Ogallala, Nebraska. They purchased Pete’s Package Liquor Store and later the Culligan Soft Water company, and thus began their tenure as local fixtures in Ogallala. Continuing his tendency for entrepreneurial achievements, Dale later purchased Kates Motel on Highway 30 & East G street. He converted the service station attached to the motel into Ogallala Ice Co. which delivered ice to Ogallala and Lake McConaughy. Somehow during this time frame, Dale also served as a Nebraska Meat Inspector, car salesman at Schultze Ford and sold mobile homes at Hillcrest Housing. Dale and Betty purchased what became the local legendary Pioneer Trails steakhouse in 1978. The steakhouse was the first to serve prime rib in the area. He also added Valentino’s to the local restaurant experience, which is still in place today. Family was important to Dale, and they worked side by side in most of these ventures. In 1980, Dale and Betty went into business with daughter Carla and son-in-law Danny Flansburg at Lake McConaughy’s Kingsley Lodge. They did this again in 1989 by bringing the first Arby’s restaurant to Ogallala. Dale’s family was always close to his heart, and family gatherings, grandchildren and great grandchildren were the highlight of his life. Sports were his favorite pastime. Watching his son Doug and then later his grandchildren and great grandchildren play sports were number one on his list. His second favorite was, of course, Nebraska football. You could find him at most high school sports events through the years. Dale promoted and believed in the town of Ogallala and wanted to see it grow. He was a 50-year plus member of United Methodist Church, charter member of the Optimists and a proud Elks Lodge member. Dale is survived by his wife Betty of Ogallala, daughters Carla (Danny) Flansburg of Ogallala, Kathy (Gene) Collins of Castle Rock, CO and son Doug (Kristin) Forsstrom of Lonetree, CO; Grandchildren Darby (Erica) Flansburg of Ogallala, Dustin (Liesel) Flansburg of Falcon, CO, Shawn Forsstrom and fiancé (Katy Bonesio) of Denver, CO; Sara Forsstrom (Dan) Vaughn and Chad Collins and fiancé (Meredith Bryant) of Parker, CO; Five great-grandchildren Sadie, Tenlie, Addlie, Cason and Gavin Flansburg; Sister Eloise “Cookie” (Marv) Kampbell of Hay Springs, NE and many nieces and nephews. Memorial Services will be held at 11:00 a.m. Friday, April 26, 2019 from the First United Methodist Church in Ogallala, with Rev. Chuck Rager officiating. Interment of cremains will be held at a later date. Condolences can be left by signing the Guest Book at www.drauckerfuneralhome.com. Services will be live streamed. Memorials are suggested to United Methodist Church of Ogallala or Ogallala High School Sports. There's still time to send flowers to the Memorial Service at the Ogallala First United Methodist Church at 11:00 AM on April 26, 2019.